It’s a rare thing when you can talk with a living legend about the sport he loves. We had just that opportunity yesterday at SHOT Show when we chatted with Carl Bernosky, TEN-TIME National High Power Champion. We covered a lot of ground in the interview, discussing the future of the High Power game and the changes in hardware Carl has seen during his storied career. Carl also offers some “rock solid” advice for younger High Power shooters hoping to improve their skill sets. We also talked about Carl’s plans for 2014 and his epic battle with SSG Brandon Green at the 2013 High Power Championships at Camp Perry. Carl and Brandon battled to the last shot of the last relay of the last day. After four complete days of shooting, the two men remained tied on points and tied on X-count. Apply a tie-breaker rule based on X-count at long-range, Green was named the 2013 Champion, with Carl named runner-up. That 2013 event was a true “Battle of the Titans” between two immensely talented marksmen. We asked Carl about trends in the High Power game. He said that more and more shooters are moving to the AR15 platform. The accuracy is there, and there are advantages to the self-loading actions particularly during rapid-fire. Carl also felt that it takes more training time to master cycling a bolt while shooting in the standing position. Because he does not have to manipulate a bolt, Carl says his self-feeding AR helps him when standing (Carl is considered one of the best standing shooters ever). Though most readers will recognize Carl from reports of his many National Championships, you may not realize that Carl is also a very skilled stock-maker. Carl produces high quality laminated-wood stocks at his shop in Pennsylvania. He offers a full range of stocks for Prone, Palma, F-TR, F-Open, Long Range Benchrest competition, and he also builds fine tactical stocks and hunting stocks. You can see examples of Carl’s stocks at CarlBernosky.com. Carl recently acquired a CNC machine for inletting. This can create ultra-precise inlets for a wide variety of actions. 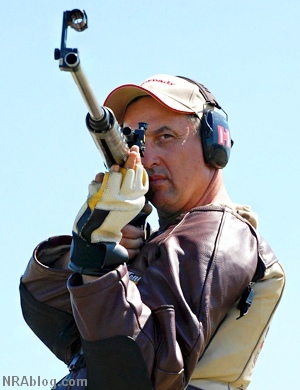 Share the post "Ten-Time Champ Carl Bernosky Talks about the High-Power Game"
Carl just happens to also be one of the best pistol shots in the USA. Worth mentioning I think! How can a semi auto help in a slow fire standing match?